I say not my usual since it wasn’t on the normal night we ride. 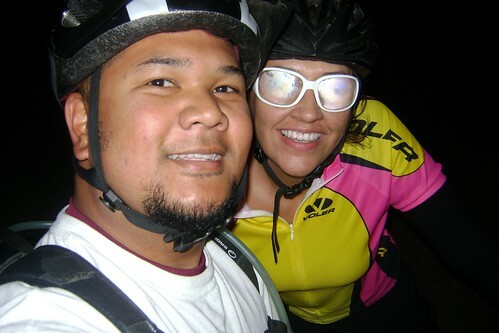 But on Monday, I came home from work and Priscilla asked if we could go on a night ride. I said, “tonight?” After a small dinner, Priscilla and I got our bikes ready for our little adventure through the Fullerton Loop. 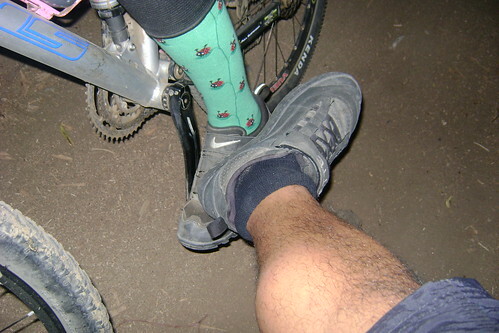 Mind you that when we normally go night riding, there’s usually a few riders on the trail that we’d run into. But Monday, it was all quiet. We only saw 2 other riders that evening, plus it was cooler than we expected. Anywho, we had a great time riding. Even though Priscilla didn’t even break a sweat, I was hustling. It’s really tough to try and keep up with her since anytime she rides, she’s in “training mode.” That means her little legs need to be spinning super fast and all her climbs are done on the middle ring while standing. I forgot to mention that when conditions permit, she’s on her big ring mashing it. This style of riding often leaves me dry heaving after each climb…this fat boy just can’t swing it. Priscilla told me that Monday night was Crazy Sock Night. She busted out her Lady Bug knee highs and I rolled down my socks like a school girl. If this was a contest, I’m sure she would have won. Girls are made of Sugar and Spice and Everything Nice….. Previous PostPrevious Most Beautiful Bike?